The cover of the copy I picked up in a Baku bookstore said it would read like Pavic. Nah. It was as if a conspiracy of serendipity. 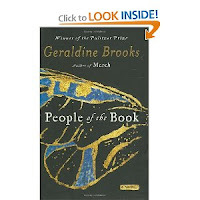 I was looking for a book of Jewish parables and saw a Russian edition of People of the Book, by Geraldine Brooks. Not following today's fiction too much, perhaps I wouldn't notice it and pay any attention, if a day before, a friend didn't post a status in Facebook about the very same book. Adding to my curiosity, it was a book about an old Jewish book. And I decided to read it, for I couldn't find a decent book of Jewish parables I was looking for. But to the end of the first chapter, I realized it wouldn't add to the treasury of world literature. Penned by an understudy of Arthur Conan Doyle, the book is about an understudy of Sherlock Holmes, who is in a pursuit of a mystery surrounding one medieval Jewish manuscript, Sarajevo Hagaddah, in a Dan Brown style plot. There are also two additional plots, designed as if to enrich the book, but are insincere and unconvincing – first, enduring problems between the main character and her mother, and second, a love affair with a Bosnian librarian. Before us, there is a book claiming to tell a story of another book throughout its dramatic journey across troubled countries and centuries. But it even fails to be a story of a single, unremarkable woman finding her love and trying to solve problems with her mother while exploring the manuscript. Surely, it won't contribute to your intellectual backpack, but will be a good reading during long subway commutes.